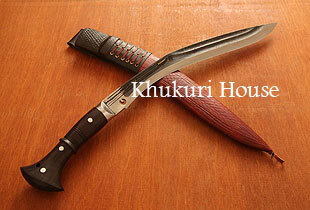 New Sirupate 15" from the stable of Khukuri House called as "Sirulange". Very much like the Sirpates crafted before but with a fuller, black unpolished blade and a different looking leather scabbard. New Sirupate 15" from the stable of Khukuri House called as "Sirulange". Very much like the Sirpates crafted before but with a fuller, black unpolished blade and a different looking leather scabbard. It also has a very comfy Indian rosewood handle and a very well balanced light blade even for this size. It is a delight to hold one in hand. Nepalese will now have more reasons to fall in love with their favorite blade "Sirupate".